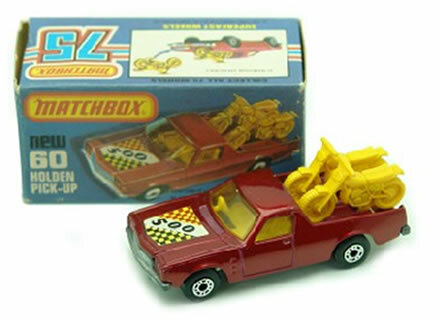 Unos de los carritos de juguete más conocidos de la serie MatchBox, la camioneta Pick-Up con las 2 motos de plástico. Este carrito es del año 1977. Esta vez no se me cayó la cedula. Aun no había nacido pero faltaba poquiiiiito! Excelente web,mil felicitaciones javier..recuerdo que cuando era chamo,al mandar a revelar un rollo fotografico o por algun tipo de servicio similar te obsequiaban un carrito de estos..mil felicitaciones,gracias por traernos tan gratos recuerdos..
Yo todavia la tengo, en su cajita original y con las 2 motos. Tengo una amplia colección de estos carritos y siempre los caonserve en buen estado. Recuerdo que me la regalaron a mis 10 años de edad. Ahora bien en los 70 estaban los Hot Wheels de mattel que eran muy chulos. Tenían unas pistas color naranja que se unian y con amarrarlo al alto de la mesa con el soporte que traian pasabamos horas y horas. Que tiempos. Yo recuerdo que tenía unos que se les abrían las puertas que eran hechos en España: un Ford Fiesta, un Renault y una camioneta Patrol. Las casas de esos juguetes eran Matchbox, Majorette, Plauart, Buddy L, Nylint, etc. tengo varios carritos de los 80….me gustaria poneme en contacto con coleccionista……. Yo tuve un a de esas camionetas cuando tenia como ocho años hoy tengo 42 años, que recuerdos. This site appears to recieve a great deal of visitors. How do you advertise it? It gives a nice individual spin on things. I guess having something useful or substantial to say is the most important thing. I adore the blog layout ! How do you make it!? It’s so nice! I get excited by computer games. Social games are good most of the time. Sometimes they’re sort of boring. I would like to thankx for the time you have contributed in composing this blogpost. I am hoping the same best article from you in the future as well. In fact your creative writing abilities has inspired me to begin my own blog now. Really the blogging is spreading its wings quickly. Your write up is a good model of it. I’m impressed, I must say. Really rarely do I see a blog thats both informative and entertaining, and let me tell you, you’ve hit the nail on the head. Your thoughts is outstanding; the matter is something that not many people are talking intelligently about. I am really happy that I stumbled across this in my search for something relating to this. You completed various good points there. I did a search on the matter and found the majority of people will consent with your blog. Hey, very nice website. I came across this on Ask Jeeves, and I am stoked that I did. I will definately be returning here more often. Wish I could add to the post and bring a bit more to the post, but am just absorbing as much info as I can at the moment. Great site here. So many blogs like yours cover subjects that can’t be found in magazines and newspapers. I don’t know how we got by 15 years ago with just newspapers and magazines. These content powerhouses are an asset to Google and not the various way approximately. But do you think Yahoo is heading to sit back again and see just anyone generate big bucks off of their top rankings?